But today was different. 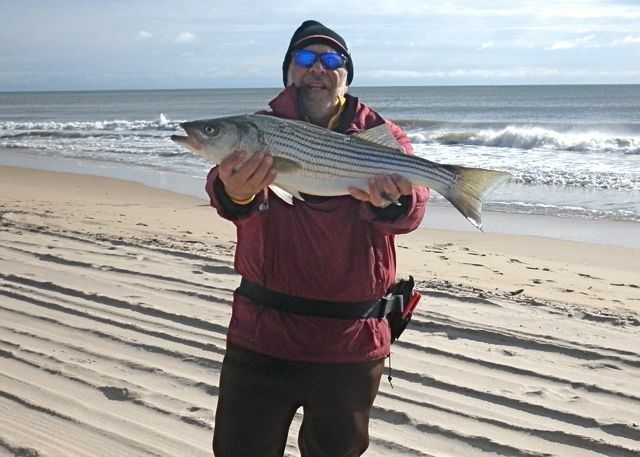 I steered wide of a couple of gaggles of avid local surfcasters–including Sam the Hook–who were bunched up at East Hampton’s Main Beach, Wiborg Beach and near Indian Wells. 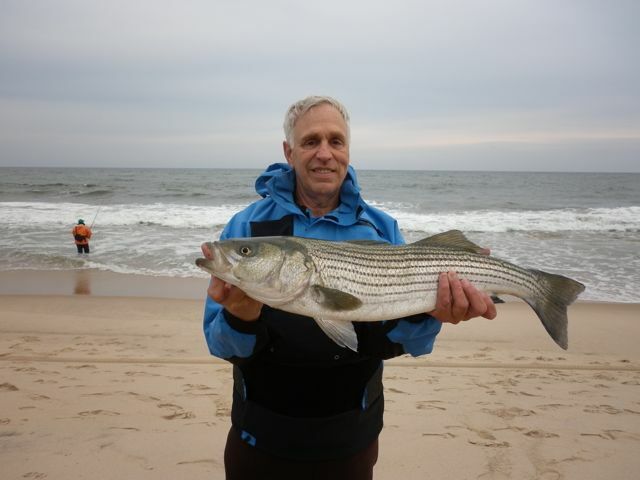 Instead, I motored east of their slow picks on small fish and waded into the water near Atlantic Ave. beach, the scene of Big Brother Frank’s pre-Halloween Sunday keeper. Right choice. I had a fish on my first cast and banged a whole bunch over the next hour with a bump on nearly every throw. I landed a cool dozen–two puny 28-inch keepers, one borderline, a double header and a bunch of schoolies from 22 to 26 inches. My ugly black-and-tan teaser fly was deadly, scoring two thirds of my catch, including the three biggest. The rest hit a slow moving AVA-27 diamond jig with a red tube. A stiff NNW wind at my back helped me cast like a champion, but the fish weren’t that far; in a trough, just beyond the inner sandbar. It was all touchie feelie on a sl-o-o-o-w retrieve. 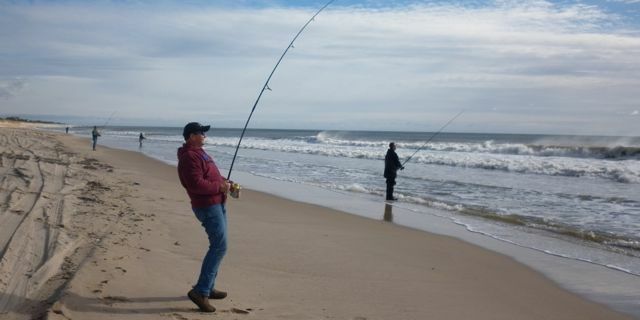 I had this steady pick of fish all to myself for about 30 minuter before the East Hampton surfcasting Cavalry showed up. At one point I walked to my truck to change lures and when I turned around, my spot was newly occupied. That’s when I knew it was time to leave. In any case, the bite died out with the tide, so it was perfect timing for a lunch break and fish cleaning. Filets first. Then I cooked down the carcass for fish stock and the fixings for striped bass brandade, a variation of a traditional Provencale dish typically prepared from salted cod. I think I really got it right this time. I didn’t even use the food processor. My Parisian buddy Angus, who is an expert with the cod recipe, would be proud. The problem with a stellar morning like this, however, is the danger of believing that surf fishing is that easy. Easy, perhaps, when you find the fish. But there’s no guarantee from one tide to the next. In the afternoon, everything looked right: moving water, birds working, lots of beach to navigate and anglers everywhere. Only problem: the bite was off. A few small fish were picked right in front of TI Drive but none for me. 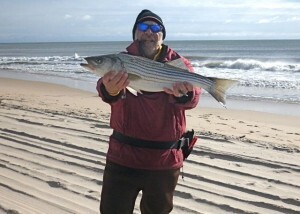 Slammin’ Sam, beyond doubt one of the most proficient surfcasters in East Hampton, nailed a pair of schoolies. But not too many other anglers did. Here is Harvey Bennett’s end-of-day Mobile Tackle Shop report. This entry was posted on Tuesday, November 9th, 2010 at 11:37 pm and is filed under Uncategorized. You can follow any responses to this entry through the RSS 2.0 feed. You can leave a response, or trackback from your own site. What can I say? Great story once again!